Scalping is a trading strategy that relies on making multiple trades over short-term time frames. The trader hopes to capture small profits while, at the same time, restricting their losing trades to a minimum. The strategy also means keeping the negative P&L from non-performing trades to the smallest amounts possible. This is done through the process known as scratching trades which closes non-performing trades for flat, or for as smaller loss as possible. The Scalper will aim to have more winning than losing or scratched trades by a multiple of approximately 2:1, though that ratio could be set at a lower level in some circumstances. Successful scalpers need to have discipline - they need to be able to read both the market and their indicators and to react quickly to any signals they produce. Perhaps most importantly of all, they need to recognise when the short term trends in price action they are following are fading, reversing or indeed fizzling out on the launchpad. The successful scalper can quickly cut or scratch nonperforming trades. And where appropriate, they can square and reverse their positions to take advantage of trend reversals and retracements. Trading time frames in scalping are exclusively intraday and are typically conducted over shorter periods, such as 1 or 5-minute windows. It follows then that scalpers operating over such time frames will need to pay close attention to their trading screens and signal generating software. Given the low profitability associated with individual trades implemented under a scalping strategy, scalpers will normally need to be in front of their trading screen for lengthy periods. That's because scalping is a low (profit) margin, high volume strategy that requires repetition, attention, dedication and aptitude. Remember you will need to dedicate several hours a day to scalping, so if you work full-time it's suited to those who are willing to get up early or stay up late and trade around various market opens; Japan open, London open, US open, Australian open. The key to a successful scalping strategy is to focus on liquid markets with tight spreads as this reduces trading costs. Management of the costs and P&L outcomes incurred in trading are very important to the end results of a scalping strategy, for example via the selection of the instruments you will trade. You will likely want to trade instruments that have high liquidity and tight spreads in your timezone. Compare the notional costs incurred and the resulting P&L amongst various pairs and crosses. Both work well, and it is simply a matter of testing what is right for you in terms of what you’re trying to achieve at any given point in time. If you decide that scalping is the trading style for you, you will need to create a scalping strategy. To do this, you will need to define a set of rules or guidelines to follow that will create your trading plan. To form these rules you will need to determine what signal or cues you will use to trigger your trades. Of all trading strategies, scalping is the one that needs to be systemised because the strategy lives or dies by its ability to minimise losses and carve out small profits on the majority of trades. To achieve this, you will need to craft a strategy that follows the "fundamental laws" of short-term trading. In particular, being able to follow and identify shorter-term trends, price action and changes therein. Having done that, to then act quickly in order to buy low and sell high, if you are on the long side. Or to sell high and buy low on a short side trade. There are many tools that can help you with the speed of trading and ability to approach all setups uniformly. 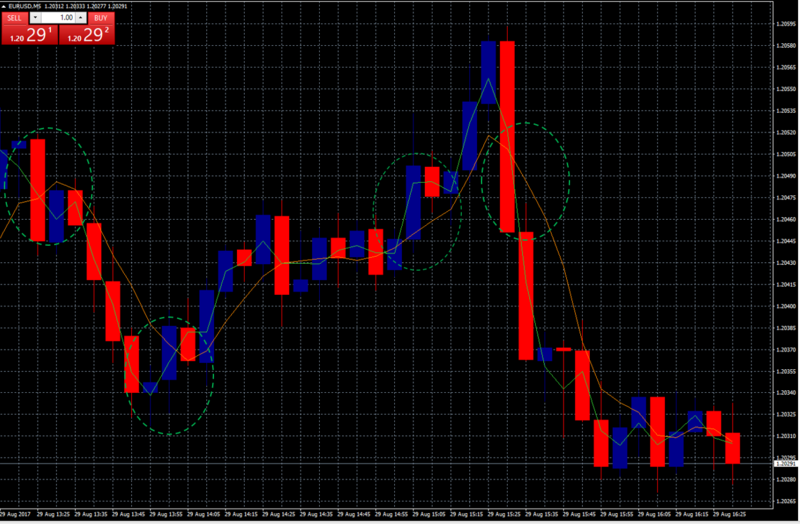 For example, many scalpers utilise hotkeys in Metatrader 4 allowing them to send instructions at the touch of a button. Other’s utilise trading scripts which instantly sends a string of orders with stops and limits attached. Pepperstone’s smart trader tool - mini terminal also allows this functionality through the creation of template orders, such as preset stops and limits or risk certain percentage of balance every trade. Mini Terminal also allows for smart lines which gives the ability for stops or limits to partially exit you from positions; a strategy known as laying. The true scalper is, of course, agnostic about overall price direction. Rather, they are concerned with capturing as many ticks (within in the period that they are active in the markets) as possible. Scalpers are by nature greedy, but not in a bad way. They just need to maximise their returns every day to stay in the game. That’s because scalping is all about the volume of trades made and the for profitable Euro-Dollar to outweigh losses, either on an outright or aggregate basis. Scalpers naturally gravitate towards those instruments with the lowest inherent trading costs and highest liquidity. That usually means the FX majors for example Euro Dollar, Cable, Dollar Yen etc. Of course, it's theoretically possible to use a scalping strategy on any instrument. But the deep liquidity and narrow spreads in FX pairs like EURUSD greatly reduce the embedded costs within scalping. To define a scalping strategy, you will probably want to use a set of indicators. For example, you may choose to plot a 5-minute chart of EUR USD with two moving averages. Perhaps a 5 period SMA, based on the average closing levels during those five separate periods. And then to compare that to a shorter term or more sensitive moving average. For example, a 1 period SMA that is based on the average price between the period highs and lows. The thinking here is that the change in both the direction and levels of the more sensitive short-term moving average, its interactions with and relationship to the 5 period SMA should provide short-term directional cues for the EUR USD price action. The chart below (a 5-minute plot of EURUSD) shows such a strategy in action with the 5 period SMA drawn in orange and the shorter term 1 period SMA in green. We have highlighted several instances, with the dashed green ellipses, where a directional move by the 1 period SMA has created potential trading signals on both the upside and the downside. These signals may be reinforced as the quicker moving average crosses over its slower moving counterpart. Of course, the scalper's skill is in interpreting the veracity of those signals, whether through intuition or more commonly through a rule-based approach. Also note the support on the far right-hand side of the chart above, circa $1.2029, which might also provide trading opportunities for an attentive scalper. Or considering the current trend on higher timeframes and only trading signals in line with the overall trend. A Scalper must find ways to increase the accuracy of their strategy as tilting the odds in their favour can have a significant effect. To help with increasing your accuracy, Pepperstone has written two trading guides titled - How to use Indicators to implement Low Risk/High Reward trades part one and part two. One of the reasons that those new to trading find it hard to adopt a scalping strategy is their inability to accept a monetary loss. And to recognise the point that a trade moves from being an “asset” and turns into a liability. Loss aversion, as this is known, is one of many behavioural biases which can hold a trader back and adversely affect their pool of risk capital. This is never truer than under a scalping strategy where we may open dozens of trades a day. Some of which will inevitably be false signals or misinterpretations on the scalpers part. To remedy this, the scalper must become adept at closing such trades at the earliest opportunity. Perhaps through the application of the monetary rule, for example closing a trade immediately if the P&L on that trade is greater than -$5.00. Note that the successful scalper will not endeavour to cherry pick which trades to close but will close all trades that meet their criteria. But the scalper will also employ a rule that determines where to close profitable trades as well - whether that's based on a strict monetary amount for example trades with a P&L greater than +$20.00 or certain percentage risk of balance 0.5%. Or perhaps with a rule based on the direction of the next candle, relative to that in which the trade was opened. I.e. if it's in the opposite direction or the previous candles high/low have been broken, then close the open trade. It should be obvious by now that successful scalping strategies rely on traders playing close attention to short-term signals and price action. The trader will probably focus on just a few instruments, with which they will become intimately acquainted. But it's impossible to focus that intently for more than a few hours at any one time without taking a break. That means that scalpers need to maximise the returns they make when they are active and alert. To do this, they need to trade without distraction. So before you decide to adopt this trading style, be certain that you have the temperament, opportunity and environment in which to work. If you are prone to constantly checking social media or live in a flat where there are always people noisily coming and going, then you may need to make some adjustments before you start to scalp the markets. You have probably also worked out by now that the short-term momentum-based trading strategies, that comprise scalping would lend themselves to the use of algorithmic trading. Such algos, trading robots, expert advisors or EAs as they are known, can monitor multiple instruments simultaneously. Watch stop loss and take profit levels and alert the scalper to new opportunities as they occur. In fact, if allowed to do so, they can even trade for the scalper directly. For more information about algorithmic trading strategies, please see our recent trading guide on the subject. But even if you don't employ an EA or trading robot you can take advantage of Peppertone’s suite of Smart Trader Tools to assist you with your scalping strategy. For example, you could deploy the High-Low indicator in combination with the SMA strategy example above, to get a sense of the overall trend and momentum in an instrument, within your trading time frames. Or perhaps to keep an eye on the "bigger picture" by comparing the near-term price action relative to the peaks and troughs of that price, over a longer time frame. In the chart below of EURUSD M5, the High-Low indicator has been deployed over an hourly time frame, alongside the 1 and 5 minute SMA lines. In this instance, the High-Low indicator provides us with some visible " boundaries" to the shorter term trading ranges. Or if you prefer, it acts as a handy visual reference point. Of course, you could also use our Pivot Point Indicator to flag potential turning points in the price action (which is based on previous days HLC data). The candle countdown tool could also prove useful allowing you to track how long there is until the next period candle is posted, as it's only at that point that emerging candle patterns are confirmed. I have heard scalping described as an attitude towards the market or a lifestyle choice, and I think there is a lot of truth in that. You don't have to do it for the whole trading day but to make money consistently via scalping, you will need to dedicate a decent portion of the day to it. You could, for example, trade from 6 am to midday or from midday until 6 pm, if you are the kind of person who can easily motivate themselves, follow a strict routine and who enjoys repetition, then scalping may well suit your personality. But if your temperament is more “laissez-faire”, that is you like variety and spontaneity, then scalping probably won’t be for you. You will also need to adopt or have the scalper's mindset of little and often. Yes, you will close some trades too early and perhaps miss out on potential additional profits. And by the same token cut or scratch losing trades that, if they had been retained may have become profitable. But the scalper takes a pragmatic view. They realise that this strategy is a numbers or volume related game and that there will always be fresh trading opportunities. After all, FX markets operate 24 x 5. He or she realises that they will never capture all the ticks on offer during trading day or session. Rather all they can do is capture as many of them as they can when they are actively trading, following their rules and strategy. And in doing so they hope to preserve and ultimately grow their capital to allow them to remain in the game for as long a period as possible. After all, longevity is most definitely the trader's friend here.